When I was emailed in regards to a new book that features both Halloween and Christmas, I was intrigued to know more and was delighted when I was sent a copy of the book for the purpose of this post. The Befana Drama is a paper back book which is suitable for ages 8+ so I took this opportunity, being the keen reader I am to start reading the book. 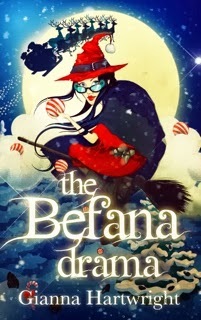 The most unusual 'witch book' for Halloween 2013 has to be the newly launched children's book The Befana Drama by Gianna Hartwright, which not only sprinkles witch dust of the most wondrous kind, but also throws in Christmassy magic for good measure. The Befana is not just any old witch, but a witch who has been Italy's present bringer for centuries, bringing coal or candy to naughty or good children, She is so famous, she even has her own festival, post box and pretend Befana house. In fact, life is just perfect for this witch .. until she learns her festival is being ‘downsized’ and her popularity lower than Santa's. That is more than this particular witch can bear and so she flies into a rage that sends candy balls bouncing down the street. This starts a global adventure by broomstick that sees her flying to Dubai, Germany, Russia, America, Iceland and Lapland, buying enough coal and candy to try to get her own back by taking over Santa's deliveries. On the way, she does some of her legendary broomies and cartwheels while flying in the night skies and adjusts her glasses to night vision! The complications are many. For a start, this witch was once engaged to Santa and still has a soft spot for him. Secondly, her spells are a little wonky and wayward. Thirdly, she needs to have her beloved broom adapted, which means visiting the 'Most Fearsome Feller in Folklore' in his tree dwelling in the Black Forest, as he is the best ‘adaptation artisan’ in the broom world. Added to that, she needs a disguise, so has to rejuvenate herself with the assistance of Old Father Time and become a much cooler witch called 'Bef' and not The Befana. But is this enough for her to overcome fearsome foe and the very vain Capriccia Claus and the sly 81st elf? To do so, this particular witch needs allies ... but are a boy band, the best reindeer whisperer the world has ever seen and an exiled-to-Siberia tailor of any use to her? Will she actually remember or be able to cast any of the spells in her Grandissimo Libro di Scongiuri? Only the lucky young reader will find out! My personal view on this book is excellent, a 5 star read for children, and adults like me who love the various holidays I celebrate, such as Halloween and Christmas! The Befana Drama costs £8.99 and is available online at Amazon and Local Book Shops as well as direct from good bookshops. More information and a Key Stage 2 education pack are available at The Befana Drama. Make this your child's Halloween and Christmas read for 2013 and you won't be disappointed! An e-book version, priced £6.99 will be launched at Amazon, Kobo and Lulu on October 12 – to coincide with Columbus Day celebrations, which mark Italian heritage. www.giannadellaluna.com where there is also more information about the author.